Horton Plaza Shopping Center! Here's The Latest Update! With 900,000 square-feet of retail space and very few stores still open, what’s going on? Horton Plaza will be closing down completely in the next few months after it’s 33 years of operations. It will be transforming into a new modern office park to hopefully kick start that area again. Currently, the real estate investment firm is in escrow waiting for it’s takeover. The idea is to reshape the mall into a place that feels open and exciting to be in. 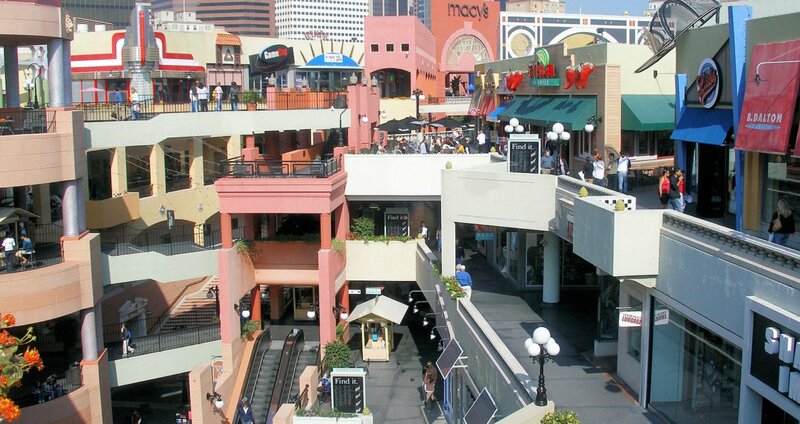 As you already know, Horton Plaza is difficult to navigate around once inside. It has a lot of staircases, escalators and different levels making it slightly overwhelming. The new plans will remove all of that and start over. Their vision is to have the ground floor full of storefronts with small shops, fitness venues and restaurants. The office spaces will hopefully bring high paying jobs to the area. Tech jobs are booming and this would be a great spot to bring thousands of new jobs to downtown. The large vacant stores that are currently at Horton Plaza will be converted into high ceiling offices with lots of light. The outside of the buildings will be re-skinned and the developer will create an artsy feel to the buildings. While the exact plans are not available to the public at this time, the builder says the idea comes from the recently completed Galleria Corporate Center in Arizona. Search For Downtown Property- Click Here! Why is Horton Plaza closing down? Horton Plazas retailers have been struggling over the past few years due the online shopping boom. The mall is also very confusing and frustrating to get around from store to store, as well as it being very outdated. It couldn’t compete with the other malls around the area such as Fashion Valley and UTC which feature a lot of higher end stores. This project should be great for the area bringing more jobs and really making downtown a live and work community. Most people that live downtown commute out of the city to work or vice versa. The resolution of the lawsuit that Jimbo’s brought to Horton Plaza may determine how long before the project can get started.